Well it took me five days, but I’ve made it through the entire, latest instalment of Forge World’s Imperial Armour book and I have to say they’ve done an excellent job (as usual). Given we have this excellent medium of the blog, I’d like to share my thoughts on this book. Below I’ll discuss all the individual segments of the book, highlight some of my favourite things and try to take a peek into the future of what we may expect when Imperial Armour X arrives. 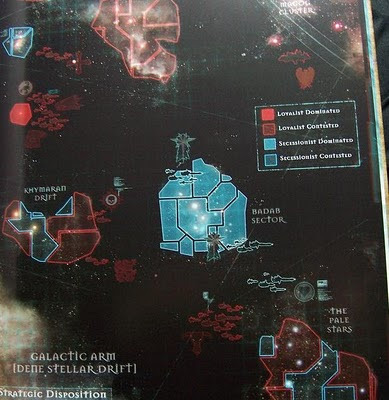 - Background on the war itself, all the way until the Loyalists reach the actual Badab sector itself. - Background, selected battle honours and war disposition on 11 of the 18 factions involved in the war. - Rules and background for 11 great leaders belonging to these factions. - Campaign rules, ideas, scenarios and rules. 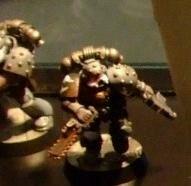 - The Tyrant’s Legion army list. Additionally the book is lavished with battle shots, star maps and the characteristic Forge World unit schematics. And as usual the print quality is of superb quality, though this should be expected from a 45 pound purchase. The background section on the war provides the reader with a thrilling tale detailing the events leading up to the creation of the Maelstrom Warders, the rise of the Astral Claw chapter and their eventual corruption under the leadership of the insidious Lugft Huron. More so than any of the previous Imperial Armour book, this edition places the conflict it discusses into the broader scale of the 40K universe. This is, of course, not unexpected given the large scale of the Badab war. Doing this infamous conflict justice the writers weave an interesting tale of pride, arrogance and victories grasped from Huron’s claw. Yet the story is much broader than this one, pivotal character as blood oaths, even against better judgements, drew other chapters to his side it what once may have been a noble attempt to drive the darkness of the Maelstrom back into the abyss. As the Astral Claws and their fellow Warder chapters drift further away from their original mandate we are presented with an escalated conflict that evolves from an internal conflict, to political and greed driven retaliation, all the way up to full blown rebellion and war. Despite that this first book only deals with a portion of the forces involved up and until the actual invasion of the Badab sector itself, we constantly come across references to the yet undiscussed chapters. One such reference in particular stood out for me, a short story about the Executioners. This chapter comes to Huron’s help, though the short story clearly shows that they are fully aware of how this support will doom them. I definitely look forward to reading more on them when the second book arrives. The same holds true for the illusive Mantis Warriors, who constantly show up in the book, though their chapter and special characters will have to wait till part II. This is actually the only real letdown in the book for me, I would and could have easily waited a while longer and paid more to get the entire Badab War in a single, massive tome. Of course this approach is part Forge World marketing, part clear desire of the writers to truly make something special of this rather famous topic. It certainly keeps me interesting to see what they will come up with, especially after reading the Vraks series of Imperial Armour. Those three books each deal with a clearly distinct segment of the struggle on Vraks, while constantly revealing new plot twists characters and units. Being already familiar with a fair amount of the general background of the Badab Wars, I decided to start with these sections first. In this first book we get about 2/3 of the Chapters involved in the incident, most of them from the loyalist side. In fact in the first volume only the Astral Claws and the Lamenters pass by, while the 'Imperium' gets the Fire Hawks, Marines Errant, Red Scorpions, Fire Angels, Raptors (Huzzahs, love these guys), Novamarines and the Howling Griffons. Regardless of the imbalance between good and evil, which is unavoidable given background on the involved forces, I've thoroughly enjoyed this section. I was particularly impressed to find tons of little references to other conflicts, races and characters. Just to name a few we have Periclitor the Foresworn, the Sanctified, Vandire, the Corinth Crusade and the Lok'Krol. Save for the continual, ‘Chapter X’ has been on the verge of destruction numerous times, this section is very well written and entertaining. 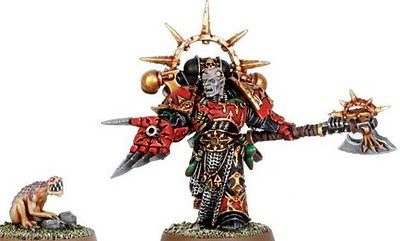 In addition to background on 2/3 of the chapters you will also find rules for 11 different characters to add to your armies, with the Astral Claws and Red Scorpions naturally getting a bit more attention than the others. All of these characters have quite interesting attributes and skills, while also adding interesting rules (many of them Chapter Tactics) to the armies they will end up leading. Many of these are especially effective in the special scenarios discussed in the campaign section (see below). Below you can find a quick overview of the available characters, their affiliation and a brief summary on their skill set or play style. 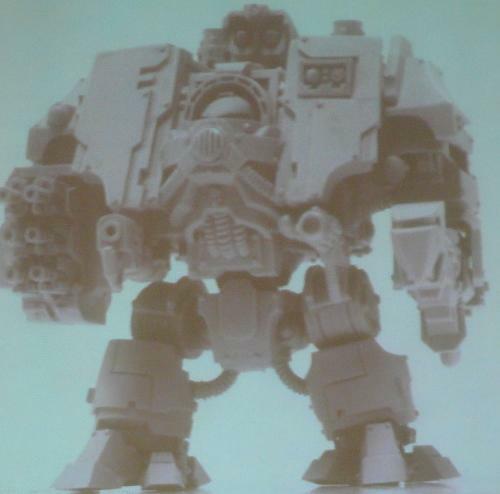 - Chaplain Dreadnought Titus (Howling Griffons) - Walking venerable icon, making nearby units fearless. - Lugft Huron (Astral Claws) - Strong fighting leader that adds bonuses for seizing the initiative, ordnance support, who also has a surprising knack for staying alive when all seems lost. 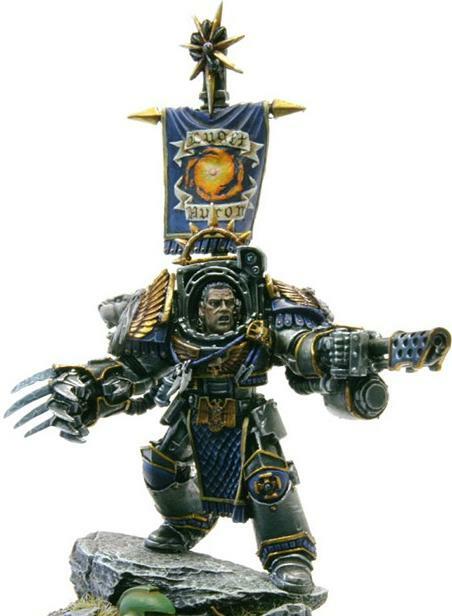 - Captain Corien Sumatris, the Tyrant’s Champion (Astral Claws) - Very agile duellist that will give many an enemy IC pause to confront him. 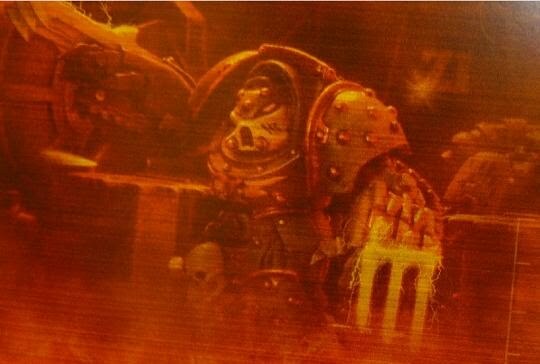 - Armenneus Valthex (Astral Claws) - Master of the Forge and a quite competent fighter due to his alchemistry experimentation and the Indynabula array. Also allows you to use the usual Master of the Forge bonuses. - Lieutenant Commander Anton Narveaz (Marines Errant) - Turns a unit into Dark Void elites (see campaign section for more info on this). 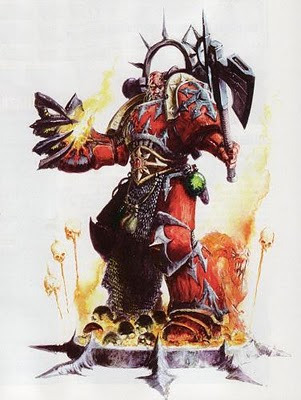 - Magister Sevrin Loth (Red Scorpions) - Very powerful psyker who can use three powers a turn, including one that turns his 2+ artificier armour save into an Invulnerable save! - Lord High Commander Carab Culln (Red Scorpions) - Buffs combat resolution around him and an army led by him can replace veteran sergeants with Apothecaries. - Captain Tarnus Vale (Fire Angels) - Is stubborn, lets Troops replace combat tactics with Tank Hunter and any vehicle he gets into also benefits from the USR. - Lias Issodon (Raptors) - Sneaky, stealthy character that influences initiative chances can ambush a unit and has a rather nasty custom Omen pattern boltgun. - Malakim Phoros (Lamenters) - Can only be used in combination with Codex: Blood Angels and is a rather skilled fighter that will get enraged once wounded. - Captain Mordaci Blaylock (Novamarines) - And finally we normal Space Marine players get a character that makes all Terminator units scoring. 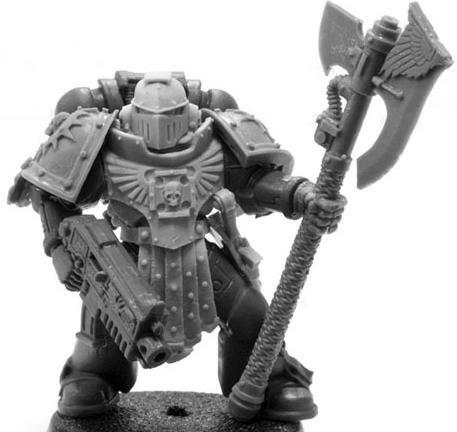 - Knight-Captain Elam Courbray (Fire Hawks) - Makes all flamer weapons twin-linked, while Assault and Vanguard squads also count as scoring. That, and Courbray is one serious fighter, who finally gets a jump pack to lead the charge by example! The campaign segment may just be my favourite part of the book as it both provides solid support for starting players and tons of freedom, ideas and rules for the more advanced ones. This section starts off with the Badab campaign, detailing the six phases and associated victory point and reward system. Each phase additionally gets a special mission that directly ties into the storyline behind that particular part of the war. It is slightly odd though that even though the book only deals with the first part of the war you do get scenarios that will take you directly to the doorsteps of Huron’s Palace of Thorns. Regardless the campaign offers good fun for players of all skill levels and even invites non Space Marines or Imperial Guard players into the fray by introducing the Forces of Ruin. All in all you get some special scenarios, a Planetstrike game, a huge Apocalypse fight at the gates of the Palace of Thorns and my favourite: boarding action rules. That’s right you get to take your lovely Space Marine miniatures into the bowels of an enemy vessel. I was particularly amused to read the following sentence, ‘Hyper-competitive players will be better served elsewhere’. So what makes this new mini-ruleset so interesting, well it allows you to make some utterly impressive terrain and there is quite a bit of randomness in there to stir up stuff. In principle both the attacker and defender get a maximum of 1500 points to spend on minis that do not include vehicles, larger walkers and artillery. The attacker naturally planned for this fight, so he gets some more Elites (one is even mandatory). Now as most of us know, space is not a very warm and cosy place and as a result weapons work slightly different as the atmosphere is lowly draining from the boarded vessels. The presence of the cold void means that even a small puncture of one’s gear can mean certain death, which is represented by most weapons becoming Rending, though units with a 2+ save and with AVs are unaffected by this. Note though that you can also use strategems (1 + 1 per 500 points in your army), which included Void Hardened armour. Secondly we also get some nifty rules for outer hull (or atmosphere less planet) engagements where blast weapons can literally send your mean flying off into space! Personally I can’t wait to give these rules a shot and to make it even better you have to construct deck levels in which you will be fighting and boarding. Naturally those lucky enough to have a copy, old or new, of Spacehulk can use the tiles included in these games as a perfect starting point for Boarding Action. In addition to the new Boarding rules, scenarios and Chapter characters we also get the Tyrant of Badab’s own personal Legion. The book says it best with the quote ‘lions lurking amongst jackals’. This armylist gives you a force that at its core has a solid, durable Astral Claw cohort, surrounding them is a large auxilia of expendable troops. And when I say expendable, I do definitely mean expendable as most of the auxilia will provide cover saves for the Astral Claw units. Most heavy support is provides by mercenary forces, auxilia batteries and Russ support groups. The rules really fit with the feeling you get from the fluff section of the Astral Claws. Two unique units particularly stand out for me and deserve an extra mention. 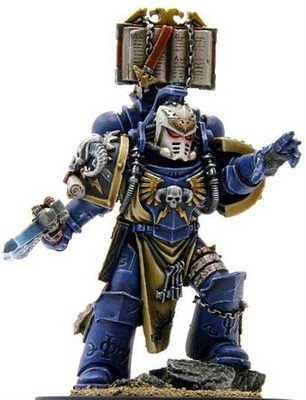 First up is the Corpse Taker, this former Apothecary of the Astral Claws now wanders the battlefield joined by a unit of mediservo-units in search of Geneseed, both of the fallen Astral Claws and any other allied, enemy, living or dead Marine. Secondly we have the mercenary Marauders, drawn to Huron’s cause through bribery, fear and intimidation. They really remind me of the old Lost and the Damned units as they get a broad selection of gear and can add several brutish creatures to their unit. Naturally this list does feel a little bit rushed together with tons of exclusive Forge World items all over the place. However, it will make for a very fun to make and play force that will definitely behave as its background dictates. Heck you have no choice as you already need to select one mandatory 20-men strong meat shield for your first Troop choice. 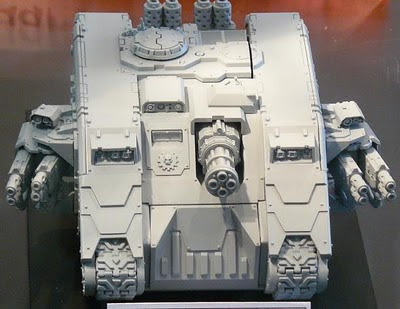 The more ambitious converters and gamers out their will also find comfort in the arms of this list as it will also be the perfect basis for an Alpha Legion, or even an Iron Warrior, force. SO WHAT CAN WE EXPECT FROM PART II? Well, several conclusions can be drawn based on Part I. First off we’ll get the rest of the story dealing with the invasion of the actual Badab sector. Additionally the missing chapters will get background and character rules (Loyalists: Salamanders, Minotaurs, Sons of Medusa, Exorcists, Carcharodons & Star Phantoms; Secessionists: Mantis Warriors and Executioners). Logically we can also count on one or multiple of the still to be discussed Chapters to get some character sculpt love, but beyond that, at least for the moment, we’re just left guessing. + Very well written background detailing the first half of the Badab War and about 2/3 of the factions involved in the fighting. 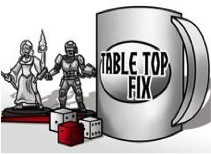 + Excellent rules for new characters, boarding action and the Tyrant’s Legion. + Stunning artwork, paper and print quality. + Despite following an existing conflict both the writing and the rules provide plenty of space for those wanting to experiment. + The books comes with a rather large poster with both a star chart of the Badab War on one side and Ancient Kleitor, Astral Claws Venerable Dreadnought on the other side. + Supported by the release of a broad range of old Mark conversion kits from Forge World. + Well you may have guessed it from the rest of the review, but those boarding rules truly are awesome! - Well it’s all about the guys in power armour and the meat shield Auxilia standing in between them, not a whole lot of interest here for the pure Xenos players and fans. - Huron knows how long we will have to wait for the second book to arrive. I also got a specific question from Lamenter fan Vinny on my blog, on whether or not the book would be worthwhile for a Lamenter fan. So I might as well throw that answer in here as well. 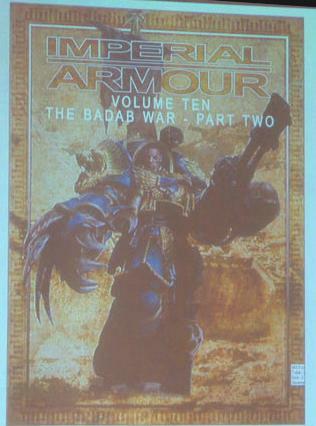 The book is full of references to the Lamenters, their past and direct involvement in the Badab War. The section on the Chapter’s history provides a ton of little details about their past, adding more depth to events which we so far only knew by name. Furthermore you get rules for Malakim Phoros, Master of the Lamenters, Lord Ruin and Watcher of the Deeps. So from having to borrow other Blood Angel characters you now get the actual, former, leader of this cursed Chapter. Furthermore you also get information on how the Badab War ended for the Lamenters, how many of them survived the last desperate battle against the Minotaurs and how many of them where stations elsewhere, stayed with Huron and may now, in fact, be part of his cursed Red Corsairs. Given that the Minotaurs still need to be discussed in the next book, we may very well see more information on them in that publication as well. As for whether you should cash out 45 pounds of this book, if you’re only interested in the Lamenters information then I’d say no. 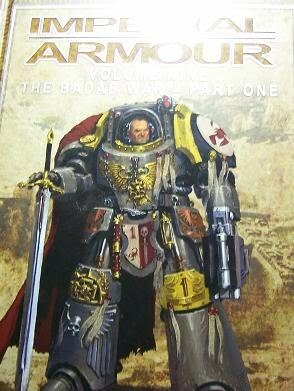 If you like Space Marines and even have a mild interest in the conflict I’d say don’t hesitate to buy it. If not I can still heartily advice you try to get your hands on the book eventually by boring it for a mate or shop, even if only to read the Chapter’s background and have a look at Phoros’ rules! So to finish this review off, I’ll drop one final shot of some Lamenters in here. Thanks for reading, I hope this was useful and until the next review! On the back of your review I've bought the book and I'm fully looking forward to sitting down and devouring it piece by piece. 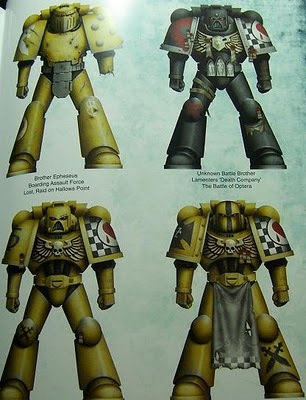 Not only the Lamenters part but the whole history of the Badab War. My pleasure mate, got started and really enjoyed the book. So I figured I might as well do a decent review and since you had a quite specific question I could easily look into it as well!